The piranha's lake has been taken over by tourists. With the people coming in to fish and throw parties in the lake, the piranha have to change their diet to humans. They don't mind so much though because that fatty human meat is making them grow and adapt quicker than usual! Upgrade a vicious school of fish with the iron-rich human blood! 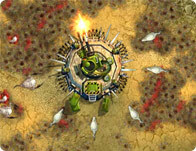 Use the mouse to direct and move the piranhas. These silly Mooks are always putting themselves in precarious situations! Feed the Mook the appropriate food, and they'll go away. Feed them all quickly in this gravity puzzle for a high score! Zombies aren't bad, they just like brains. We all like something so why hate, why judge? Just help. Go through mazes, puzzles and obstacles to keep your zombie army happy. Have you ever wanted your own strange and beautiful garden? Sew the seeds of your wildest fantasies and launch your very own floral paradise in this cute cannon game. You've only got 15 minutes to save the world and enjoy a steaming hot cup of coffee. Quest your way through endless levels on a heroes journey that ends at the water cooler. The Coffee Story is a simple and short point and click adventure game you can play while the coffee runs through... Now go and take a little coffee break. Guide the ball to the finish. This Speed Freak needs to collect the coins before he runs out of time. Jump, duck, and slide through each of the levels and collect your coins as fast as you can!